1. To be able to like you. Ever hear someone assume everything their ex says is a lie, even when it’s true? Ever notice how gullible people seem when they find a new love, even when it’s all a lie? Don’t act angry all the time. It’s exhausting to witness. Don’t make it too personal. It’s “icky” to witness other people feuding and unprofessional, especially since they view counsel as the “grownups” in the room. Keep it simple for them to keep score, from opening, throughout the evidence, and closing, by being thematic and giving them reminders as the pieces fit together. Work with your witnesses to overcome arrogance or trying too hard to be perfect. Demonstrate that you are qualified and that your message stays the same over time. Show respect to the court. Don’t act harshly to your adversary in court, only to act like buddies as soon as you leave the courtroom. Jurors will think you are playing a game and won’t trust you. If you’re Goliath, jurors need a message that makes it OK to find for you or against David. Alternatively, you may want to shape your message to explain why it would be wrong to find against Goliath. Assuming that a 2D explanation that is purely factual (“The evidence is not there for liability, so you cannot find for Plaintiff.”) is not a message. If finding for your client would feel bad to the jury, it’s your job to deal with it. 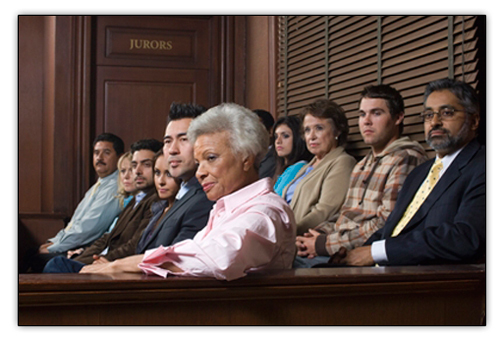 Asking jurors to find for your client does little to guide them when it comes time to answer actual verdict questions. Provide them with the actual questions, the appropriate answers as you see them, a summary of the evidence that supports those answers (ideally in graphic form), and the reasoning. 5. You’re saying and showing many things. What’s most important? Everything you say and do is not equally important. You know what is critical and what is not. While you are required to lay foundations and assemble the case from the bottom up, jurors are more likely to judge the case top-down. They tend to focus on a few key things that stand out to them and form their own story of what happened, then fit the choice things that fit well into that construct. What happens if what stands out to them misses your point altogether? What if they have no idea why you went through all that information and didn’t pay as much attention because it was boring? To avoid leaving your most important evidence – as you see it – as the stuff of their naps, reduce the risk by alerting them to vital points. Have witnesses repeat key answers. Ask, “What is the most important thing about that?” Fill your side of the courtroom with spectators when your star witness will testify. Thin out your spectators when opposing witnesses should not be seen as important. Use prefaces that alert jurors’ attention like a drum roll. Have your spectators wear their finest for special moments in the trial. Avoid being too cute, but be clear and send clear signals that help lead jurors to pay more attention to (or ignore) information so they get out what you put in to the trial.